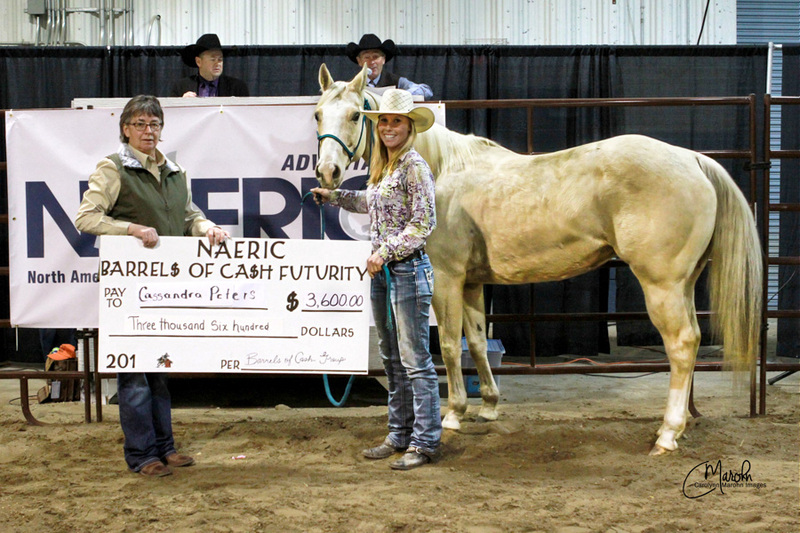 The NAERIC Barrels of Cash Sale and Futurity was started in 2008. Foals sold through the sale are eligible to run in a $9,000 added Futurity as 5 year olds and a $1,000 Sweepstakes sale in years after their Futurity year. 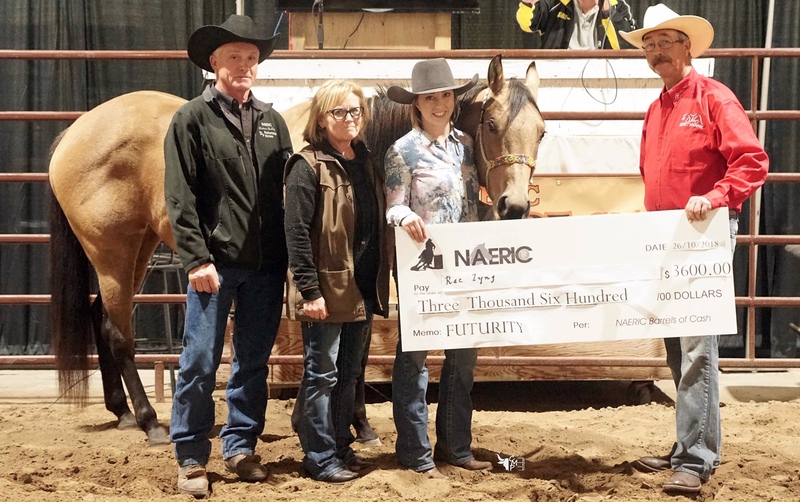 Rae Lyng rode DF Sunfrosted Carmel to win the 2018 Barrels of Cash Futurity. The 2013 buckskin mare was sired by PC Sir Azure Frost and out of IC Worth The Wait. Dean and Deb Fenty of D5 Performance Horses, Miniota, Manitoba, bred the mare. 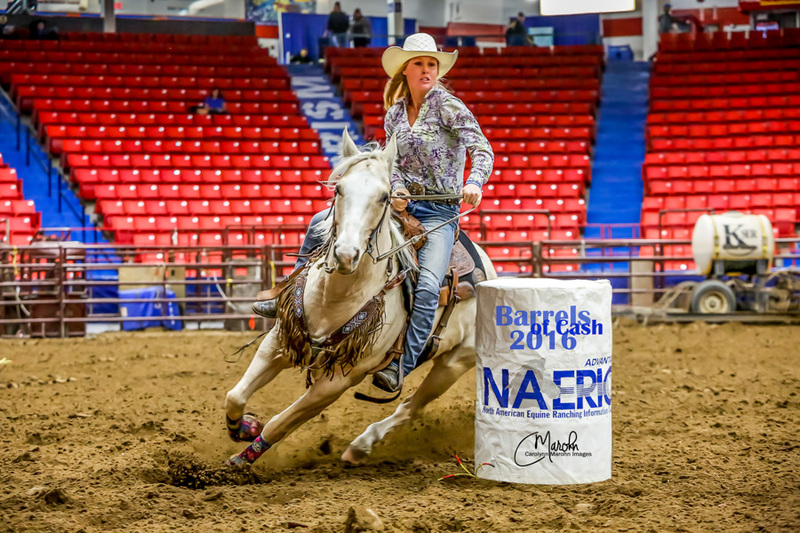 Rachelle Boyer, owner and rider of MM Frosty Cash, is the 2017 winner of the NAERIC Barrels of Cash Futurity. MM Frosty Cash is a 2012 horse by Buds Sunfrost and out of Jewels For Cash. The breeder is Bob Brickley of Moose Mountain Quarter Horses in Kennedy, Saskatchewan. Rachelle also won the NAERIC Barrels of Cash Stake Race on DACS Lazer Bed Bug. DACS Lazer Bed Bug is by Double Jac Moon and out of SQ Solanos Molly. DACS Lazer Bed Bug was bred by Duncan Campbell and Cathy Gerrand of DAC Farms in Virden, Manitoba. Cassandra Peters, the winner of the 2016 Barrels of Cash Futurity, was riding Coosa Ima Echo. Coosa Ima Echo was bred by Kelly and Ruby Stuart of K and R Stuart Quarter Horses, Eriksdale, MB, was sired by Echo Three Ohs and out of Becoosa Sheza Zipper.